I am excited by mother nature’s bounty as much as the next gal or guy. Now, I may be more restrained in my response, but the feeling is still there. Yet, I feel that maybe I need to express myself more forthrightly – let go a bit – give a bit of shout, if not a scream. A case in point. There’s this guy who saw a double rainbow – one of mother natures true mysteries – close to (but not quite) as amazing as the Northern Lights/Aurora Borealis. So what? Well it seems that not only were the rainbows amazing, but so was his response. Basically he lost it – in awe – tongue-tied. And for his grand expression of awe, and the videotaping and subsequent release of that video on YouTube, his video went viral, and he started up a whole new business. So has does this link to my concern over my diminutive emotions? 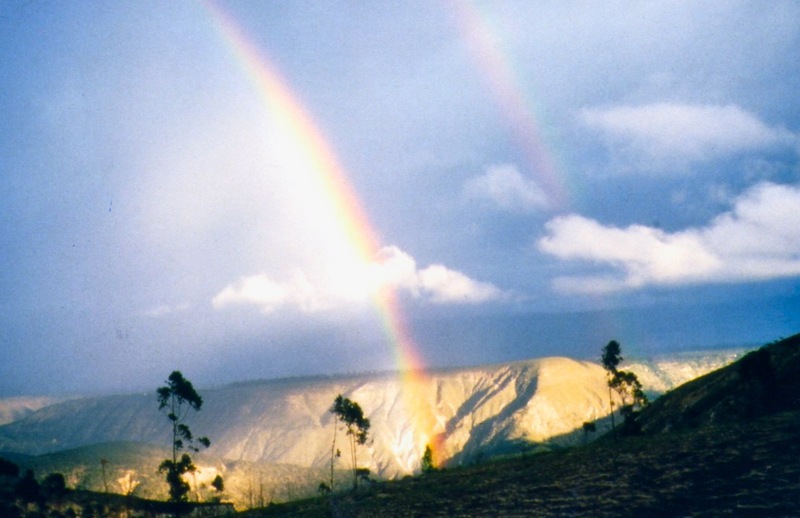 Well, I saw the same (if we put physics and time aside) damn rainbow in Ecuador 13 years ago! Perhaps if I had the same response I could have been rich! famous! Clearly YouTube did have something to do with it, but perhaps a few copied video tapes, and bam! I’m rich and famous and would be having someone else write silly blog posts like this. So, I promise from here on in to get in touch with my emotions, my inner awe. Believe me you, you’ll know when I see a double rainbow next time around. p.s. this is my favorite rainbow song – Israel Kamakawiwo’ole’s Somewhere Over The Rainbow. Sign up for the Pradical blog here!